People often worry about snakes living in their attics. I am frequently asked by people who have a snake phobia (ophidiophobia), whether or not I think snakes might be living in their attic. I always tell them no, because such a thing is very rare. However, on occasion, a snake will be found in an attic. This is no cause for concern, because I've only witnessed three species of snakes in attics - all members of the rat snake family, which are good climbers, and completely harmless. The snake I've seen most commonly in attics (only 5 times in my life) is the Yellow Rat Snake. I've also seen Red Rat Snake (Corn Snake) in attics. In every single case of a snake in the attic, the attic also had a heavy rat infestation. Thus the snakes are probably following the scent of rats into the attic, looking for food. People ask me whether or not snakes are looking for a good place to nest in an attic. It's true that many mammals like to have a litter of young in a warm, safe, attic, but I'm not sure about snakes. I have observed just one case in my lifetime in which a snake laid a clutch of eggs in a house. The occupants caught 27 baby Yellow Rat Snakes in their home over a period of two months, so I must conclude that a large adult Yellow Rat Snake laid eggs either in the attic or somewhere in the house. This event is rare, and this specie of snake is completely harmless. I went into the attic of this home, which was full of rats, and lo and behold, found a Yellow Rat Snake going about its business. I quickly grabbed both the snake and my camera, and took this photo. When I got out of the attic, I had the homeowner take this photo for me. He actually suspected he had a snake in the attic, because he heard odd "circular slithering noises" up there, and he had an "eerie feeling" about his attic. And oh yeah, he added, the previous night he observed the snake had crawled down the wall, poked its head out of a hole, and gone back up. 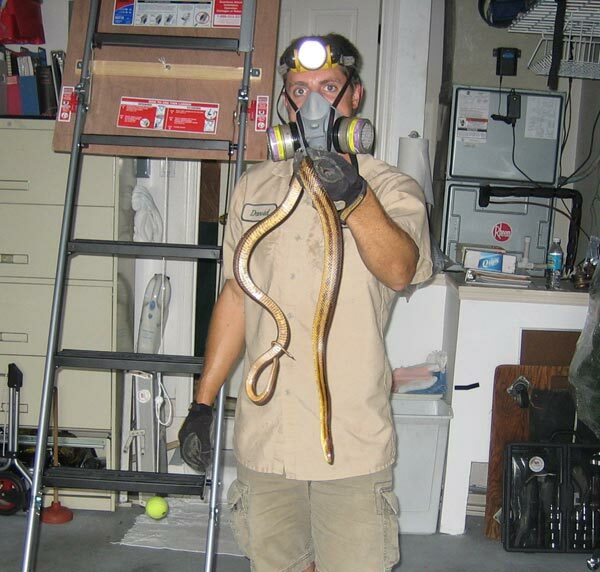 How to get a snake out of your attic - Getting a snake out of your attic does not have to mean a big, dramatic event. 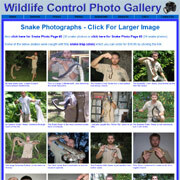 Snakes are no different than other animals, though their ?cute appeal? is decidedly low. Most snakes inside the home are not venomous; however, you must be sure of this fact before you try to remove the snake. Most bites occur during the handling process. The easiest way to handle a snake without harming it is to cover it with a thick blanket and put the bundle into a pillowcase. The snake can then be transported off the property when it can be released. 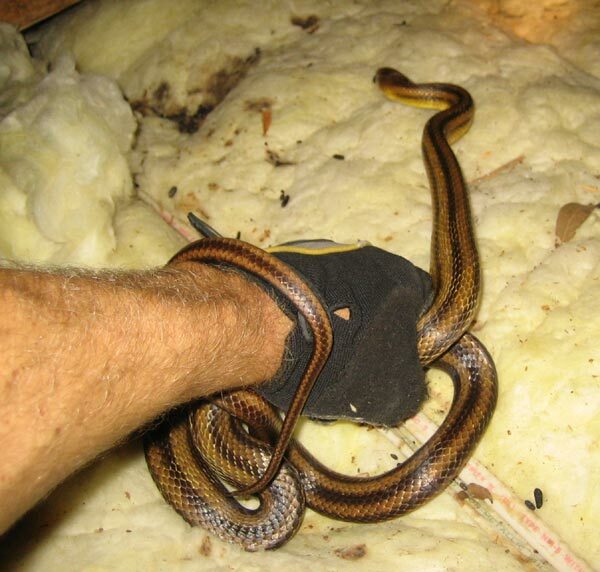 The hard part, however, with snakes in attics is that they are usually very hard to find. They often hide under the insulation, down walls, or in dark corners. There's very little chance that you'll find it. However, if the snake is in plain sight and there's easy access, it's not to hard. You can use a broom to shoo the snake into a bin, but too much manhandling of the animal may result in injury. Unfortunately, snakes are not as easy to herd as other nuisance animals. Instead of slithering into a garbage bin, the snake may slither under your furniture. For this reason, prior to attempting to corral the snake, make sure any difficult areas to access are closed off with rolled up linens or towels. A snake is not as industrious as a rodent at breaking through a barrier. 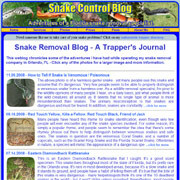 Snakes that are in the home because they are living in the foundation may be more difficult to catch, and even if you do catch the snake, it is pointless to release it if the foundation crack still exists. 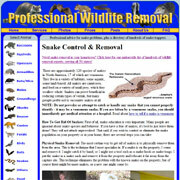 Make sure you repair your home prior to snake removal.